Poliwag in game: 5,290 Who? Important notice! Pokemon Poliwag is a fictional character of humans. Poliwag resembles a blue, spherical tadpole. It has large eyes and pink lips. There is a black and white swirl on its abdomen, which are actually its internal organs showing through its semitransparent skin. The swirl looks clearer after it eats, and the skin is very elastic so that it will not break if the Pokémon is bitten. The direction of the belly spiral differs by area, with the equator being thought to have an effect on this. It has newly developed legs that are poor at walking, and no arms. Its long, mostly transparent tail makes it a powerful swimmer. 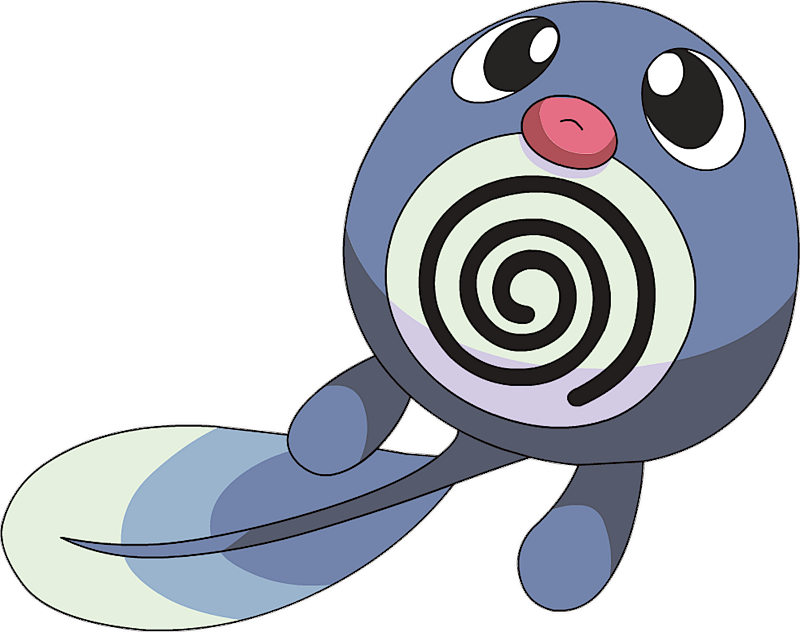 Because of its ineptitude on land, Poliwag is more likely to be found swimming in small freshwater ponds and lakes. In the anime, Poliwag feeds on salveyo weed, which can only be found on clear lake bottoms. Misty had a Poliwag that eventually evolved into a Poliwhirl and then a Politoed. One of the Pokémon used at the Pokémon Trainer's School in Gonna Rule The School was a Poliwag. Max used it in a battle. It helped defeat Team Rocket later on. A Poliwag also made an appearance in Like It Or Lup It!. Poliwag first appeared in Primeape Goes Bananas. Poliwag also appeared in the banned episode EP035. A Poliwag appeared in A Chansey Operation and The Breeding Center Secret. 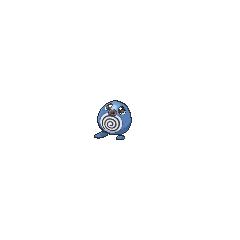 Multiple Poliwag were among the Pokémon seen at Professor Oak's Laboratory in Showdown at the Po-ké Corral. Poliwag also appeared in Pallet Party Panic, at a party among other Pokémon. A Poliwag was among the Pokémon controlled by Cassidy and Butch in Pikachu Re-Volts. A Poliwag under the ownership of an unnamed Trainer was treated by Nurse Joy in The Joy of Pokémon. Multiple Poliwag also appeared in The Power of One and Pokémon Heroes: Latios & Latias. Four Poliwag were among the Pokémon competing in the Fire and Rescue Grand Prix in The Fire-ing Squad!. A Poliwag was one of the inhabitants of an oasis just for Pokémon in Got Miltank?. A Poliwag was seen in Octillery The Outcast, under the ownership of an unknown Trainer. A Poliwag made a brief appearance in Dueling Heroes. A Poliwag was seen at a Pokémon Center in The Legend of Thunder!. Lola has a Poliwag as seen in A Family That Battles Together Stays Together!. In that episode, Flint revealed that the reason he had fallen in love with Lola was the precision of her Poliwag's Hydro Pump against his Graveler, now a Golem. A Poliwag appeared in The Saffron Con as a Pokémon owned by a Coordinator. A Poliwag appeared in Curbing the Crimson Tide!, and another in Up Close and Personable!. Multiple Poliwag were owned by a family of traveling circus performers in Pokémon Ranger and the Temple of the Sea. A Poliwag also appeared in One Big Happiny Family! in Jessie's fantasy. A Poliwag appeared in The Scheme Team, Bagged Then Tagged!, and The Dream Continues!. Multiple Poliwag made a brief appearance in Coming Full-Festival Circle!. A Poliwag made a very brief appearance in League Unleashed!. A Poliwag appeared in a flashback in Giving Chase at the Rhyhorn Race!. In Danger: High Voltorb, a flashback shows Red's Poliwhirl, Poli, as a Poliwag. It has since evolved into Poliwrath. Gold has a Poliwag in Murkrow Row, one of the many Pokémon raised in the house he lived in. It was lost when Team Rocket stole Gold's backpack and its Poké Ball was lost when fell into the water. Gold eventually retrieved Poliwag at the Famous Fishing Zone from a wild Granbull that was stealing to draw attention so that it could get its jaw healed. It evolved into Poliwhirl in Ampharos Amore and then evolved straight into Politoed utilizing a trade with its held King's Rock. In Volume 8 the previous illustrator Mato, had used Polibo with a King's Rock as a self-portrait. 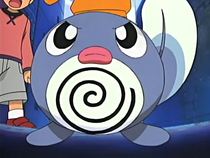 A Poliwag appeared in Slugging It Out With Slugma where it is seen as one of the Pokémon at Earl's Pokémon Academy in Violet City . A prototype design of Poliwag was shown on Game Freak's official Japanese website.